The greatest joys of having a digital life are the serendipitous, happenstance encounters I often have with people, words, and ideas that lead me to other ideas, words, and people. Once in a while, I become so moved, I am compelled to do something. This is one such occasion. There have been too many times recently when I felt overrun by brokenness and damage–from my own shortcomings, those belonging to others, and from events in both the national and global stages. This morning, I was reminded of the beauty of redemption. 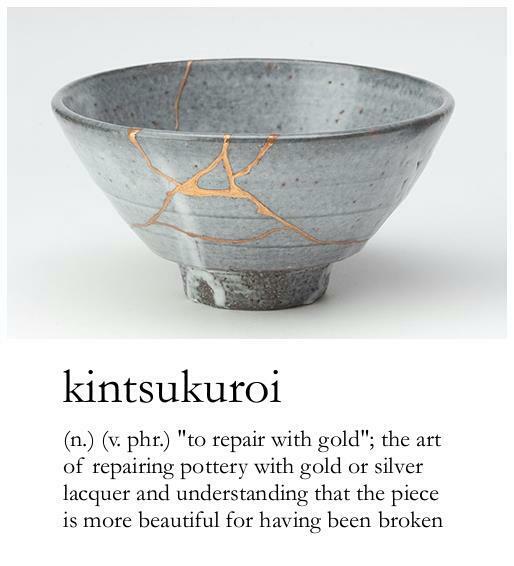 It is central to the art of kintsukuroi. Simple, beautiful, elegant. Thank you, Melissa Martin Powell, for leading me onto this path. The quotation on the image above is from Melissa. Thank you, Nazgul2, for the Creative Commons share-alike image on this post. Now I must read, research, and learn more.